Continuing controversy over the Vizhinjam sea port has prompted Kerala chief minister Oommen Chandy to call an all-party meet on June 3. The contract for building the port superstructure and operating it has been given to Adani Ports and Special Economic Zone (APSEZ), the country's largest multi-port operator. The chief minister's move came in the wake of the Opposition parties, mainly Communist Party of India (Marxist) and CPI, airing apprehensions over the way the Kerala government took the decision. They have also levelled corruption charges against the government. The Rs 6,700 crore project is a public-private partnership, being implemented by Vizhinjam International Seaport Limited (VISL), a special purpose vehicle formed by the state government in 2009. The state will take up the site development work that includes sea reclamation, dredging, rock removal construction of breakwater and quay wall, land acquisition, road and rail connectivity and ensuring water and power supply. The private party will bear the expenses for building the superstructure of the port. This part would cost an estimated Rs 4,089 cr. The private party will operate the port for a period of 40 years. Initially, five major private companies had expressed interest in the project. However, when the five-time extended deadline for submitting the final bid for the project ended on April 24, Ahmedabad-based Adani Ports emerged as the sole bidder and the Chandy government decided to proceed with award of project to the group. Adani Ports has sought Rs1,635 crore as grant for the proposed port project. Chandy had held a pre-bid meeting with prospective companies, including the Adani Ports. An empowered committee headed by chief secretary Jiji Thomson and the board of directors of VISL, chaired by the chief minister, have cleared the bid of Adani Ports despite the fact that it was the lone bidder. "With just the Cabinet clearance to be made, we decided to hold an all-party meeting to clarify all issues. We are going for the all-party meet with an open mind," said Chandy while briefing the media after the Cabinet meeting held Wednesday. After the all-party meet, the government may take a final decision in the Cabinet meeting to be held on June 10. 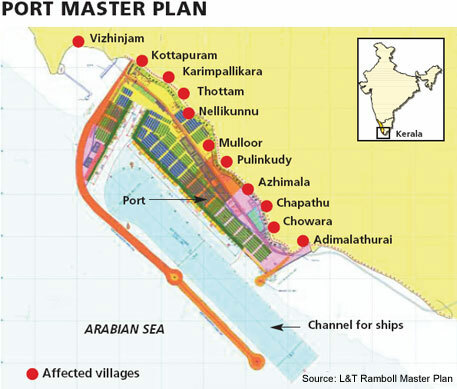 The Vizhinjam port is projected as a dream project that would bring huge development to the state. However, financial and ecological experts have warned against the project. The state government's argument is that at present almost 40 per cent of India's transshipment is done at the Colombo port in Sri Lanka and if Vizhinjam port is built, it can contribute significantly to the container transshipment business of the country. However, the state's advisory body for the project, International Finance Corporation, part of the World Bank group, had warned the government against the project. The report submitted to the state government in 2010–Vizhinjam : Strategic Options—warned the project could push Kerala into a debt trap, considering the huge cost involved and the low returns for the state. The report said that being new in the business, the port would attract ships only if it gives at least 40 per cent concession over the charges in the Colombo port in Sri Lanka. The IFC report clearly says Vizhinjam will have stiff competition from Dubai, Singapore and Colombo ports. It also says that since the focus is on transshipment, the project will not contribute much to regional economic development. Besides, ecology experts have pointed out that the port will cause huge damage to marine ecology since 80 hectares from the sea will have to be reclaimed for the project.